A very few days after the events chronicled in the last chapter I became the victim of a railroad accident which brought me to the threshold of death and for many months made it impossible for me to follow the events of the war, or the growing conspiracy against the Sovereigns. At a little past five o'clock of the afternoon of January 2, 1915, I took the train at Tsarskoe for a short visit to my parents in St. Petersburg. With me in my carriage was Mme. Skiff, a sister of a distinguished officer of Cuirassiers. We sat talking the usual commonplaces of travel when suddenly, without a moment's notice, there came a tremendous shock and a deafening crash, and I felt myself thrown violently forward, my head towards the roof of the carriage, and both legs held as in a vise in the coils of the steam-heating apparatus. The overturned carriage lurched and broke in two like an eggshell and I felt the bones of my left leg snap sharply. So intense was the pain that I momentarily lost consciousness. Too soon my senses returned to me and I found myself firmly wedged in the wreckage of wood and iron, a great bar of steel crushing my face, and my mouth so choked with blood that I could not utter a sound. All I could do in my agony was silently to pray that God would give me the relief of a quick death, for I could not believe that any human being could endure such pain and live. After what seemed to me an interminable length of time I felt the pressure on my face removed and a kind voice asked: "Who lies here?" As I managed to breathe my name the rescuers exclaimed in astonishment and alarm, and immediately began to endeavor to extricate me from my agonizing position. By means of ropes passed under my arms and using great care and gentleness they ultimately got me free and laid me on the grass. In a moment's flash I recognized one as a Cossack of the Emperor's special guard, an excellent man named Lichatchiev, and the other as a soldier of the railway battalion. Then I fainted. Ripping loose one of the doors of the railway carriage, the men placed me on it and carried me to a near-by hut already crowded with wounded and dying. Regaining consciousness for a moment, I begged in whispers that Lichatchiev would telephone my parents in St. Petersburg and their Majesties at the palace. This the good fellow did without delay, and he also brought to my corner one of the surgeons summoned to the wreck. The man gave me a rapid examination and said briefly: "Do not disturb her. She is dying." He left to attend to more hopeful cases, but the faithful soldiers still knelt beside me, straightening my crushed and broken legs and wiping the blood from my lips. In about two hours another doctor, this time the surgeon Gedroiz, under whom the Empress, her daughters, and myself had taken our nurses' training, approached the corner where I lay. I looked with a kind of terror into the face of this woman, for I knew her to be no friend of Mme. Simply giving my wounded head a superficial examination she said carelessly that I was a hopeless case, and left me without the slightest attempt to soothe my pain. Not until ten o'clock that night, four hours after the collision which had wrecked two trains, did any help reach me. At that hour arrived General Racine from the palace with orders from their Majesties to do everything possible. in my behalf. At his imperative commands I was again placed on a stretcher and carried to a relief train made up of cattle cars. At the moment my poor father and mother arrived from St. Petersburg and the last things I remember were their sobs and a teaspoonful of brandy mercifully poured down my throat. At the end of the journey to Tsarskoe Selo I dimly recognized the Empress and the four Grand Duchesses who had come to the station to meet the train. Their faces were full of sympathy and grief, and as they bent over rite I found strength to whisper to them "I am dying." I believed it because the doctors had said so, and because my pain was so great. Then came the ordeal of being lifted into the ambulance and the half-consciousness that the Empress was there too, holding my head on her knees and begging me to have courage. After that came an interval of darkness out of which I awoke in bed and almost free from pain. The Empress who, with my parents, remained near me, asked me if I would like to see the Emperor. Of course I replied that 1 would, and when he came I pressed the hand he gave me. Dr. Gedroiz, who was in charge of the ward, told everyone coldly to take leave of me as I could not possibly live until morning. "Is it so hopeless?" asked the Emperor. "She still has some strength in her hand." Later on, I do not know exactly when, I opened my eyes quite clearly, and saw standing beside my bed the tall, gaunt form of Rasputin. He looked at me fixedly and said in a calm voice: "She will live, but will always be a cripple." A prediction which was literally fulfilled, for to this day I can walk only slowly and with the aid of a stout stick. I have been told that Rasputin recalled me from unconsciousness, but of his words I know only what I have recorded. The next morning I was operated on and for the six weeks following I suppose I suffered as greatly as one can and live. My left leg which had sustained a double fracture, troubled me less than my back and my right leg which had been horribly wrenched and lacerated. My head wounds were also intensely painful and for a time I suffered from inflammation of the brain. My parents, the Empress, and the children came every day to see me, but despite their presence the neglect and unkindness of Dr. Gedroiz continued. The suggestion of the Empress that her trusted physician, Dr. Federov, be brought into consultation was rudely repulsed by this woman, of whom I may finally say that she is now in high favor with the Bolsheviki whose ranks she joined in the autumn of 1917. Waited upon by none but the most inexperienced nurses, I do not know what might have become of me had not my mother brought to the hospital an old family nurse whom she absolutely insisted should take charge of me. Things went a little better after this, but happy was I when at the end of the sixth week, against the will of Dr. Gedroiz, I left that wretched hospital and was removed to my own home. There in the peace and security of my comfortable bedroom I enjoyed for the first time since my accident quiet and refreshing sleep. It seems strange that the hostile and envious Court circle had deeply resented the daily visits of the Emperor and Empress to my bedside. To placate the gossipers the Emperor, before visiting me, used to make the rounds of all the wards. In spite of it all I had many visitors and many daily inquiries from the Empress Dowager and others. Very soon after my arrival home I was examined by skillful surgeons, among them Drs. Fedorov and Gagentorn, who pronounced my crushed right leg to be in a very bad condition and placed it in a plaster cast, where it remained for two months. 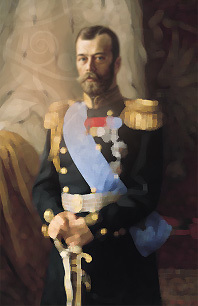 The Empress visited me daily, but the Emperor I seldom saw because, as I learned indirectly, the War was going very badly on the Russian front, and the Emperor was almost constantly with the armies. In the last week before Lent he came to my bedside with the Empress, in accordance with an old Russian custom, before confession, to beg my forgiveness for possible wrongs done me during the year past. Their pious humility and also the white and careworn face of the Emperor filled me with emotion which later events served only to increase, for very momentous and trying hours were even then crowding the destiny of Nicholas II, Tsar of all the Russias. A soldier of the sanitary corps, a man named Jouk, had been assigned to duty at my house, and as soon as I was able to leave my bed he took me daily in a wheeled chair to church, and to the palace. This was the summer of 1915, a time of great tribulation for the Russian Army, as every student of the World War is aware. Grand Duke Nicholas Nicholasevich was pursuing a policy which rightly disturbed the Emperor, who constantly complained that the commander in chief of his armies sent the men forward without proper ammunition, without artillery support, and with no adequate preparations for safe retreat. Disaster after disaster confirmed the Emperor's fears. Fortress after fortress fell to the Germans. Kovno fell. Novogeorgiesk fell, and finally Warsaw itself fell. It was a terrible day when the Emperor, white and trembling, brought this news to the Empress as we sat at tea on her balcony in the warm autumn air. The Emperor was fairly overcome with grief and humiliation as he finished his tale. "It cannot go on any longer like this," he exclaimed bitterly, and then he went on to declare that in spite of ministerial opposition he was determined to take personal command of the army himself. Only that day Krivosheim, Minister of Agriculture, had addressed him on the impossible condition of Russian internal aff airs. Nicholas Nicholasvich, not content with military supremacy, had assumed almost complete authority over all the business of the Empire. There were in fact two governments in Russia, orders being constantly issued from military headquarters without the knowledge, much less the consent, of the Emperor. Very soon after the fall of Warsaw it became dear to the Emperor that if he were to retain any dignity whatever he would have to depose Nicholas Nicholasevich, and I wish here to state, without any reservation whatever, that this decision was reached by the Emperor without advice from Rasputin, myself, or any other person. Even the Empress, although she approved her husband's resolution, had no part in forming it. M. Gilliard has written that the Emperor was forced to his action by bad advisers, especially the Empress and Rasputin, but in this he is absolutely mistaken. M. Gilliard writes that the Emperor was told that Grand Duke Nicholas Nicholasvich was plotting to confine his Sovereign in a monastery. I do not believe for a moment that Rasputin ever made such a statement, but he did, in my presence warn the Emperor to watch Nicholas Nicholasvich and his wife who, he alleged, were at their old practices, of table-tipping and spiritism, which he thought to be a highly dangerous way to conduct a war against the Germans. As for me, I repeat that never once did I say or do anything to influence the Emperor in state affairs. I wish I could here reproduce a letter written to my father by the Emperor in which all the reasons for taking the step he did were explained. The letter, alas! was taken from me by the Bolsheviki after my father's death, and I suppose was destroyed. On the evening when the Emperor met his ministers to announce his great decision I dined at the palace, and I was deeply impressed with the firmness of the Emperor's decision not to be overborne by arguments or vain fears on the part of timid statesmen. As lie arose to go to the council chamber the Emperor begged us to pray for him that his resolution should not falter. "You do not know how hard it has been for me to refrain from taking an active part in the command of my beloved army," he said at parting. Overcome and speechless, I pressed into his hand a tiny ikon which I had always worn around my neck, and during the long council which followed the Empress and I prayed fervently for the Emperor and for our distracted country. As the time passed the Empress's anxiety grew so great that, throwing a cloak around her shoulders and beckoning me to follow, she went out on the balcony, one end of which gave on the council room. Through the lace of the window curtains we could see the Emperor sitting very upright, surrounded by his ministers, one of whom was on his feet speaking earnestly. Our eleven o'clock tea was served long before the Emperor, entirely exhausted, returned from the conference. Throwing himself in an armchair, he stretched himself out like a man spent after extreme exertion, and I could see that his brow and hands were wet with perspiration. "They did not move me, he said in a low, tense voice. "I listened to all their long, dull speeches, and when all had finished I said: "Gentlemen, in two days from now I leave for the Stavka. " As he repeated the words his face lightened, his shoulders straightened, and he appeared like a man whose strength was suddenly renewed. Yet one more struggle was before him. The Empress Dowager, whom the Emperor visited immediately after the ministerial conference, was by this time thoroughly imbued with the German spy mania in which the Empress and Rasputin, not to mention myself, were involved. She believed the whole preposterous tissue of lies which had been built up and with all her might she struggled against the Emperor's decision to assume supreme command of the army. For over two hours a painful scene was enacted in the Empress Dowager's gardens, he trying to show her that utter disaster threatened the army and the Empire under existing conditions, and she repeating over and over again the wicked slanders of German plots which she insisted that he was furthering. In the end the Emperor left, terribly shaken, but with his resolution as strong as ever. Before leaving for staff headquarters the Emperor and his family took communion together at the Feodorovsky Cathedral and at their last meal together he showed himself calm and collected as he had not been for some time; in fact, not since the beginning of the last disastrous campaign. From headquarters the Emperor wrote full accounts of the scenes which took place when he assumed personal command, and of the furious anger, not only of the deposed Nicholas Nicholasvich but of all his staff, "Every one of whom," wrote the Emperor, "has the ambition himself to govern Russia." I am not attempting to write a military history of those years, and I am quite aware of the fact that most published accounts of the Russian Army represent' sent Nicholas Nicholasvich as the devoted friend of the Allies and the Emperor as the pliant tool of German influences. It is undeniable, however, that almost as soon as Nicholas Nicholasvich had been sent to the Caucasus and the Emperor took command of the Western Army a marked improvement in the general morale became apparent. Retreat at various points was stopped, the whole front strengthened, and a new spirit of loyalty to the Empire was manifest. I wish to interpolate here, in connection with the Emperor's personal command of the army, a word on the immense service he rendered it at the beginning of the War in suppressing the manufacture and sale of vodka, the curse of the Russian peasantry. The Emperor did this entirely on his own initiative, without advice from his ministers or the Grand Dukes. The Emperor said at the time: "At least by this I will be remembered," and he was, because the condition of the peasants, the town workers, and of course the army became at once immeasurably better. In the midst of war-time privations the savings-banks accounts of the people increased enormously, and in the army there was none of the hideous debauchery which disgraced Russia in the Russo-Japanese War. As an eminent French correspondent long afterwards wrote: "It is to the dethroned Emperor Nicholas that we must accord the honor of having effected the greatest of all internal reforms in war-time Russia, the suppression of alcoholism." In October the Emperor came to Tsarskoe Selo for a brief visit, and on his return he took with him to the Stavka the young Tsarevich. This is the first time he had ever separated the boy from his mother, and the Empress was never happy except in the few minutes each day when she was reading the child's daily letter. At nine o'clock at night she went up to his bedroom exactly as though he were there and she was listening to his evening prayers. By day the Empress continued her tireless work in the hospitals from which, by reason of my accident, I had long been excluded. However, at this time, I received from the railroad as compensation for my injuries the considerable sum of eighty thousand rubles, and with the money I established a hospital for convalescent soldiers in which maimed and wounded men received training in various useful trades. This, it is needless to say, became a great source of happiness to me, since I knew as well as the soldiers what it meant to be crippled and helpless. From the first my hospital training school was a most gratifying success, and my personal interest in it never ceased until the Revolution, after which all my efforts at usefulness and service ended in imprisonment and persecution. Not this action of mine, patriotic though it must have appeared, no amount of devotion of the Empress to the wounded, sufficed to check the rapidly growing propaganda which sought to convict the Imperial Family and all its friends of being German spies. The fact that in England the Empress's brother-in-law, Prince Louis of Battenberg, German-born but a loyal Briton, was forced to resign his command in the British Navy was used with effect against the Empress Alexandra Feodorovna. She knew and resented keenly this insane delusion, and she did everything in her power to overcome it. I remember a day when the Empress received a letter from her brother Ernest, Grand Duke of Hesse, in which he implored her to do something to improve the barbarous conditions of German prisoners in Russia. With streaming tears the Empress owned herself powerless to do anything at all in behalf of the unhappy captives. She had organized a committee for the relief of Russian prisoners in Germany, but this had been fiercely attacked, especially in the columns of Novy Vremya, an influential organ of the Constitutional Democratic Party. In this newspaper and in general society the Empress's committee was accused of being a mere camouflage gotten up to shield her real purpose of helping the Germans. Against such attacks the Empress had no defense. Her secretary, Count Rostovsev, indeed tried to refute the story concerning the Empress's prison-camp committee, but the editors of Novy Vremya insolently refused to publish his letter of explanation. The German-spy mania was extended from the palace to almost every Russian who had the misfortune to possess a name that sounded at all German. Count Fredericks and Minister Sturmer were among those who suffered calumny, although neither spoke a single German sentence. But the greatest sufferers were those barons of the Baltic Provinces whose ancestors had bequeathed them names of quite certain German origin. Many of these men were arrested and sent to die, or to suffer worse than death in exile. The sons and relatives of many of these very Baltic proprietors were at the time fighting loyally in the Russian Army. That there were German spies at work in Russia all during the War I have no reason to doubt, but they were the men who after 1917 invited in and exalted Lenin and Trotsky, and not the Empress and her friends, nor yet the persecuted estate owners of the Baltic Provinces. Did the Emperor's family call upon the Germans to rescue them from Siberia? Did any of the Baltic Provinces at Versailles ask to be united to Germany?